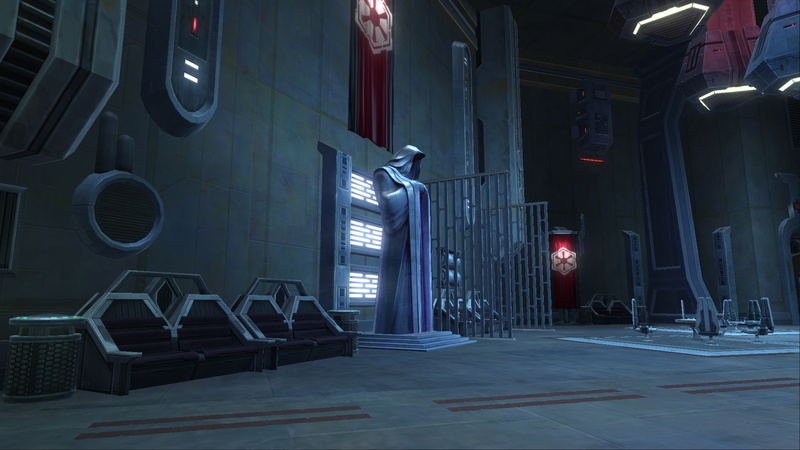 With the launch of Star Wars: the Old Republic underway, you may be finding that the same questions keep popping up with each new recruit who logs in and joins your guild. With that in mind, I’ve started this handy FAQ of the questions I am most frequently seen asked, and their answers. Feel free to point your new players this way to get their questions answered. Is there a Guild bank? No, there currently isn’t a guild bank. But it is on the developers’ “to do” list. What do I do with all my crafting materials and extra gear then, if there isn’t a guild bank? Store your crafting materials and extra gear that you intend to use at some point in your cargo hold. And use gchat to find a home for any items you don’t intend to use. You can also try selling some items in the Galactic Trade Network, but economies are still pretty soft on most servers. I don’t have my ship yet, so how can I access my cargo hold? Go to a major city and look for Cargo hold access, noted with a key on your map. But if I leave my crafting materials in the cargo hold, how can I craft anything? Your enterprising companions actually use the workbench next to the cargo hold on your ship for their crafting activities. They are able to use any materials you store in the hold to complete the items you ask them to craft. When do I get to choose my advanced class? You get to choose your advanced class after you finish the first part of your class storyline. You will have a quest that will hook you up with the NPC that will help you choose your preferred class. Characters are in the 8-11 range when this occurs, depending upon how many heroic and bonus quests you decide to complete on your starter world. Where do I go to train up my advanced class skills? Your same class trainer will be able to train you in your advanced class skills; just click on the second tab to see those trainable skills. When I open the guild window, it only shows 2 people but we have 20 folks on. How can I fix it? Hit Ctrl+U twice to reload the UI. You should know be able to see your full guild window contents. I didn’t get a chance to pick my quest reward before the window closed so now I can’t get my reward! Don’t panic! Look at the upper right corner of your screen. You should have a pending box flashing at you that will allow you to pick your reward. Go and clear out some of that bag space. You’ll find that the item you selected from your last quest turn in will show up when you make your next quest turn-in. Can I fast travel to my ship? No. At best, you can probably fast travel to the spaceport in which your ship is docked. Why should I care if my companion likes me or not? You end up with different interactions with your companion depending upon their affection level, including the possibility of romance with some of them. It should become clear very quickly what kind of answers make them angry with you; avoid that language to win points with them. And give them companion gifts that match their interest to increase their affection level. The SWTOR loading screen tips also note that companion affection level also affect the speed and quality of the crafting they perform for you. How do I split this stack of [consumable/crafting item]? Hold down shift and right click and drag to an open slot in your inventory. This will pop up a window that will allow you to split the stack into your desired quantities. Where is the speeder piloting trainer? There isn’t one. When you hit 25 and can train speeder piloting, visit your regular class trainer. They will train you on it for 40,000 credits. Where do I buy my first speeder? If you purchased the Collector’s Edition, you’ll have a special speeder. For the rest of us, the speeder vendor is available on the fleet. The starter option is 8,000 credits, putting your total cost for your first speeder at 48,000 credits. This is an attainable goal just from questing provided you loot and cash out on all your grays, and don’t spend your credits on gathering and mission skills quests. Your speeder is your ground mount. When do I get a faster speeder? How much does my second speeder ost? At level 40 you can train speeder piloting level 2, which will cost you $210,000. Purchasing your faster speeder will cost you $25,000. This puts your total at $235,000 to get faster ground mount speed. When Does (Class Y) Get Their Ship? Again, this is tied to your class quest. You’ll get this in the middle-to-end of the quest line on the second planet. If you’re sticking solely to your class quest and ignore all others you’ll get this around levels 14-16. If you’re doing all of the quests and/or mixing in some PvP action while you level, then you may get it closer to 16-19. Why doesn’t [insert action/activity here] work like it does in World of Warcraft? In case you haven’t noticed, this isn’t Azeroth. Furthermore, you shouldn’t assume all your fellow players are WoW players taking a vacation in SWTOR. The Star Wars franchises have a large fan base that don’t necessarily overlap with other MMOs. I personally know several folks who haven’t played MMOs in the past who are really excited about SWTOR and planning to play after the game launches in the US on the 20th. It was so easy for me to [get the credits for my speeder/ defeat that boss/ do some other game activity] so anyone who can’t do it must be a Noob. This is one of the most vexxing POVs to deal with. Guess what– your fellow players may have never played an MMO before. Or they may be playing on a Mac with Bootcamp and not used to Windows commands. Or a thousand other variables you can’t possibly know. So before you jump to thinking someone you are playing with is an idiot, you might want to back up a few steps, and chill it out. No one cares how easy it was for you. Rubbing it in someone else’s face that you had no problem with something that they are asking for help with just makes you a jerk at best or a bully at worst. Instead, show your expertise in the game world by helping them out. Maybe you’ll even make a new friend. When Does (Class X) Get Their Companion? This is also tied to your class quest, and not all classes are created equal. Warriors get theirs right before the “hardest” part of their class quest on the starting planet. Inquisitors get theirs in the middle of the hardest part of their quest chain. Troopers get theirs at the end of their class quest on the starting planet. The level at which this happens will vary anywhere from 8 to 11 depending entirely upon whether or not you’ve primarily focused on your class quest chain, or have been doing a bunch of other questing. I can’t find my companion. What do I do? If you were just on a taxi, it is possible that your companion was left behind. Click on their portrait window in the lower lefthand column of your screen to resummon them. If you were just in an intense firefight and they were killed, you need to go and retrieve them and resurrect them. If none of those options work, if you are at the point where you have 2 companions, summon your other companion then resummon the one you wish to be playing with. I still can’t find my companion, what do I do? If you need to resurrect your companion but can’t click the body, you can just click the competence “Resurrect companion” in your skill book (P), General Tab. None of that worked– my Companion is Still Gone! Normal flashpoint and heroic group sizes are capped at 4 members, which includes your companions. If your companion’s portrait is pushed over so that you only see the right-most edge of it on your screen, it’s because your party size is maxed and you cannot summon them. Note that in a group with 3 players, one player will get to keep their companion out. Do I earn rested XP when I am logged out? You earn Rest XP by entering a Cantina. You continue to earn Rested XP over time if you log out in a Cantina. Rested XP is currently capped at a level’s worth of experience. When you are playing with rested XP in your bar, you earn double XP from any creature kills. Rested XP does not currently contribute to any other sources of experience (completing missions, exploration, codex discovery, etc.) Logging out in your spaceship gives you rested XPas well, but you do not received the rested notification upon entering/exiting your ship which you do receive upon entering/exiting a cantina. Rested XP gains seem to be a percentage of the amount of XP needed to complete your current level, not a constant number. Do I have to sit here and wait while my companion goes out on that crafting/gathering/missions skills quest? And do I have to queue my crafting items one at a time? You sure don’t. You can queue up to 5 crafts for your companion by clicking multiple times on the “Make” button. And although you can not queue up a series of missions skills and gathering quests, you *can* send your companion out on a quest and log out, or log onto another character. When you next log on to your character, the results of your missions will be waiting for you. When Can I Send My Companions On Mission Quests? Any time you’re logged in. You can send them on missions while you’re in PvP War Zones, running PvE Flash Points, or kicking back in the VIP Lounge. They will return on time to report back with their success/failures, and you can send them right back out on the spot. If you happen to be in the middle of an activity that doesn’t let you accept them turning in the mission results then you should have the window pop up for it after you finish that activity. If it doesn’t, again look at the top right corner of your screen for a flashing “Pending” message which will pop it up. Can I grab a ride with someone in my party to head to a new planet? You sure can! Let them enter the hangar first then follow them in. Feel free to poke around on their ship, then settle in to the cockpit and enjoy your free ride to the planet! How does the Light/Dark side point system work, exactly? In your interactions with NPCs, you’ll often be given a choice between three options, with 1 being a neutral response, on giving you a red dark side emblem when you mouse over it, and the third showing a sparkly light side circle when you mouse over it. You will want to decide if you want your character to be going for the dark side points or the light side points pretty early on as your alignment to one side or the other will affect your ability to use some crafted and commendations vendor gear that requires either light side or dark side of a specific level. There is not currently equivalent neutral gear in game, so being middle-of-the-road in your decisions may cause you to miss out on some gear. Your fleet will have light and dark side vendors that have a variety of items including relics, gear, and a specific vanity pet. Does my light side/dark side affinity affect anything else? How can I see what my Frames per second (FPS) is running at? Ctrl+Shift+f will bring up a tiny FPS indicator in the lower left of your screen. I searched for the items I put up for sale in the Galactic Trade Market, but I don’t see them. What happened to them? If you have sold the items, there will be a mail for you w/notice of the sale and/or your credits. Credits come to you an hour after your item sells. Otherwise, check the Sell tab at the kiosk to see the items you currently have up for sale. They will not show up if you search on the buy tab as you can’t buy from yourself. Why can’t I log in to the game today? I’ve been playing fine since I started my early game access started. The grace period ended this morning at 2AM Central. To continue playing, you must log in to swtor.com and enter a Product Registration Code (ie, the code that came with your box or digital copy) and set up a subscription in order to continue playing. Setting up the subscription seems to be the step many folks have not completed. Even though 30days of play time comes with the game, you can not play without setting up a payment method for the recurring subscription. What do I do with these commendations I see listed in my currency tab? You can trade in commendations at the specific planet’s commendation vendor. They can be used to purchase gear, modifications, and weapons. You can find the vendors in the main town on each planet or on the fleet. Can I trade in my commendations for one planet to get commendations for another planet? No. The vendor that allowed you to trade commendations in BETA is no longer available. Where/How do I repair my gear? Any vendor can do this for you. Choose the repair all button in the lower left of their window, or go to the repair tab to repair only specific pieces of gear. This post will be updated with new FAQs as the game progresses. If I forgot one you keep hearing let me know in the comments. Enjoy your adventures!